Q: What happens if I was injured in a collision caused by an uninsured driver? A: You may have a claim for uninsured motorist (UM) benefits under your own policy. If you make a UM claim, your own carrier has the right to use all defenses that the other driver may have had against you. Many people make the mistake that they will be treated better by their own insurance company. This simply is not true. Your insurance carrier will be allowed to assert all defenses available to the at-fault driver, and the carrier almost always does. A UM claim therefore creates an adversarial relationship between you and your own insurance carrier. 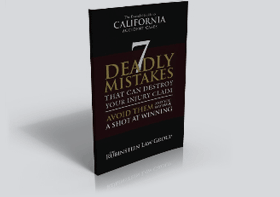 It is wise to retain an experienced attorney before asserting a UM claim. As can be expected, your own carrier will NOT be looking out for your interests (even though you are its insured!). Instead, your insurance carrier will be looking for ways to pay out as little money as possible, despite what your injuries are worth. In the event you do not have UM coverage, you may have no other means of obtaining fair compensation for your injuries. This is why you should always carry UM coverage, preferably with limits of at least $100,000. Q: I was in an accident that was not my fault. The other driver does not have insurance. Will using my own insurance to cover my property damage and medical bills increase my insurance rates? A: In most states if you are not at fault for an accident, your insurance company cannot raise your rates, cancel your coverage or fail to renew you. Q: I was involved in an automobile accident. Who is to blame? A: Since every state has a fairly extensive code of driving regulations, the simple answer to this question is that the person who is at blame is the one who disregarded one or more of these laws. The responsibility of the accident is usually determined at the scene by the responding law enforcement officer. If you were not found to be at blame, and you sustained injuries in the accident, you may have the right to file for a personal injury claim. Please contact the Rubinstein Law Group today to schedule your free car accident consultation. Mr. Rubinstein serves clients in San Marcos, Carlsbad, Oceanside, and Escondido, California. We serve clients throughout Southern California including those in the following localities: San Diego County including San Marcos, Carlsbad, Chula Vista, El Cajon, Encinitas, Escondido, La Jolla, La Mesa, National City, Oceanside, San Diego, and Vista; Imperial County including Calexico and El Centro; and Riverside County including Riverside and Moreno Valley.